Home / Articles / 2011 / MRO Q&A: How much are air-operated diaphragm pumps used? Q. How much are air-operated diaphragm pumps used in food processing systems? My guess is that such pumps could be used with recirculation of fluids and/or chemicals. I imagine that peristaltic pumps are more likely used than diaphragm pumps, but I’m sure there are some applications for diaphragm pumps. A. The food industry is a very large and diverse industry with many processing applications. When considering pumps for any processing system, the primary design considerations usually deal with the specific gravity of the product being handled, the operational temperature ranges for the specific processing system and then the required pump dynamics. In addition to these issues, the basic product viscosity and the percentage of solids within the product as well as overall system operating parameters need to be considered. 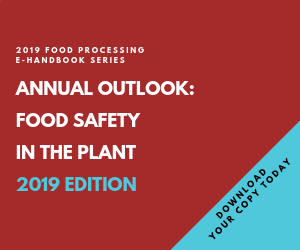 And, of course, for food-specific applications, any equipment decision must be evaluated within the focus of operational safety/sanitation requirements and economic lifecycle considerations. As a result, both peristaltic pumps and air-operated diaphragm pumps have found considerable use within the food industry. Peristaltic pumps have been used to move sterile fluids due to their inherit separation of the product from the pumps’ physical structure. As positive displacement pumps, they also have found use for moving slurries with high solids content. Air-operated diaphragm pumps are basically reciprocating pumps that have food-grade ratings when their valve seats/balls, along with their housings, are manufactured using highly polished 316 stainless steel. Polypropylene valve seats/balls and housings have found favorable use in many acidic fluid applications.